Layered blues with a sprinkling of golden and white hues. In tune. Those magic ethereal moments. 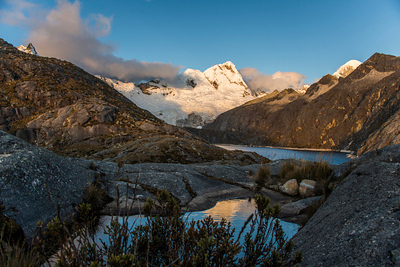 Laguna Cullicocha. Landscape photography for me isn't merely seeing the world. It's feeling it with all of our senses. Pausing and forgetting the struggles for a few, recharging and have indelible gratitude for the beauty we are presented with daily if only we pay attention. Gratitude. Pass it on. 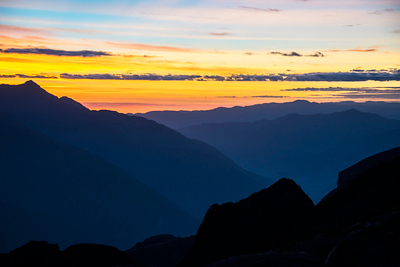 This photo was taking in the Cordillera Blanca from 15,000 ft looking across to the Cordillera Negra at sunset with the moon rising. 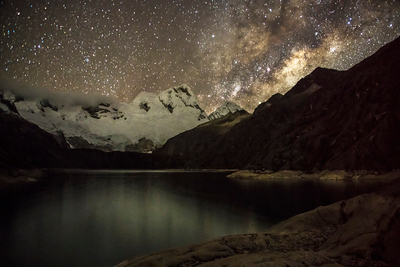 Laguna Cullicocha and Santa Cruz peaks on a clear evening reveals celestial bodies so overwhelming, it almost brings you to tears. 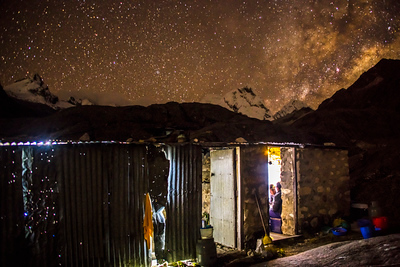 You began to let your mind wander about life out there and how insignificant and incredible the universe is. It's impossible to ignore. 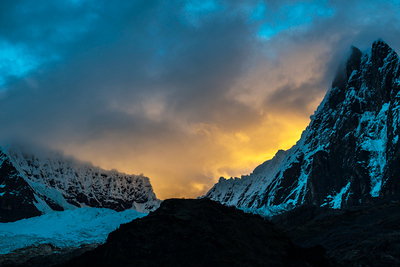 The iconic pyramid and summit of Alpamayo (19,511), one of the most beautiful mountains in the world. 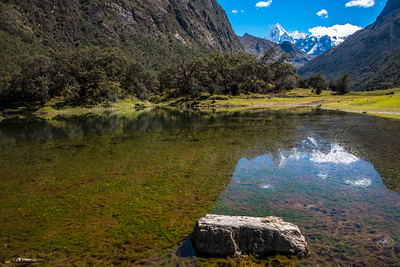 Oh.....Just another day in the Cordillera Blanca, Peru. The routes of man. Notice the passenger vehicle on the left for perspective. 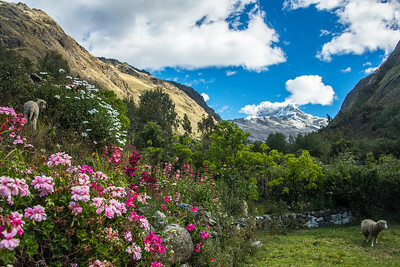 Huascaran, Peru's highest peak looms behind. Amazing to think how much work goes into construction of something like this. This road changes communities. It provides access. It changes lives in complex ways. 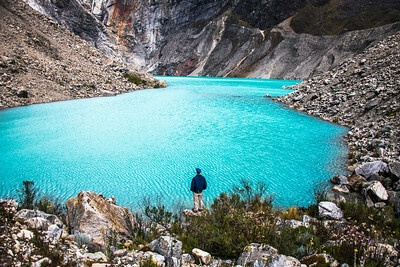 My favorite photo from our two weeks spent in the Cordillera Blanca. 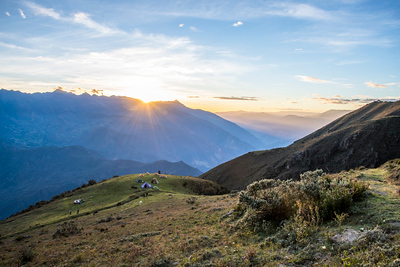 My good friend and local guide Lucio and I hiked up from Cedros Valley before sunset, so I could try and get some shots of the famed Alpamayo. 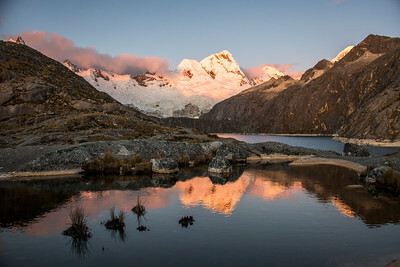 Clouds lingered, obscuring a significant part of the pyramid, so I turned my attention, eyes and camera on the nearby glaciers above as alpenglow danced across thick snow and ice rendering it a ethereal pink as the sun dipped below the horizon. As I clicked the shutter, Lucio turned to view the image on my camera LCD screen and gasped, "Awowwwww". Esta es buenisimo! Mi Favorito! Mi corazon! 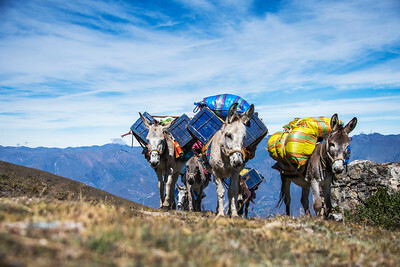 Qué pasión tenemos para las montañas!" To share a sunset with a dear friend who has spent over 30 years working in the region, and for him to get as excited as the he surely was the first time had me smiling smile ear to ear and filling overloaded with gratitude. It was a special moment. I gave him a big hug , genuinely thanked him for joining me on a little excursion that I usually take in solo, and we headed down to the tents for dinner. 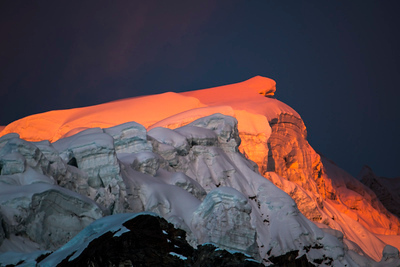 Dramatic light at sunset beneath Alpamayo. This might just actually be the stairway to heaven. Cue Led Zeppelin. 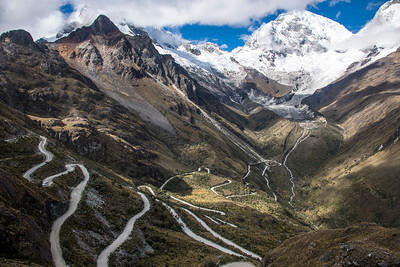 Cordillera Blanca, Peru. Impossibly blue. Some places are so beautiful you stand there for an hour and get lost within. 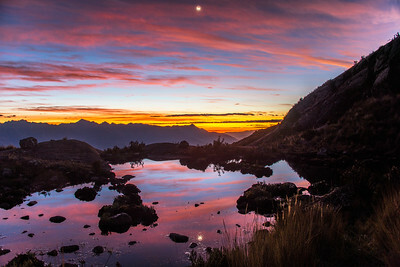 Laguna Jancarurish . 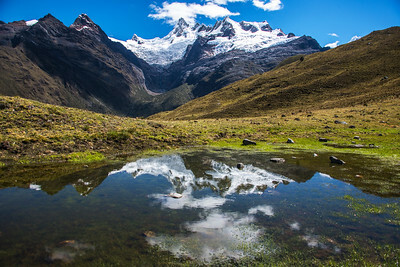 Cordillera Blanca, Peru. eflections...The more time I travel, the less I realize I need. 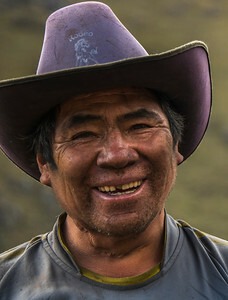 Community, connection, culture, presence...oh and my mountain bike and cameras :). I can't comprehend why so many of us in the west or 'modern' world exhaust our resources at an alarming rate and often suffer from insatiable appetites to collect and consume. The traditional American Dream, in my humble opinion is a cancer to our planet. We cannot keep on like this. We would need 6 more earth's to adequately provide if everyone was to live like we do in the states. 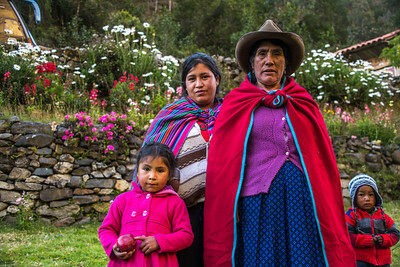 We have so much to learn from those who live one with the land and each other. Honestly, I get a bit frustrated with our overall lifestyle in the ‘west.’ We are selfish and complain too much. We frequently brag about all that we have individually accomplished and don’t celebrate solidarity and the power and success that stems from it. 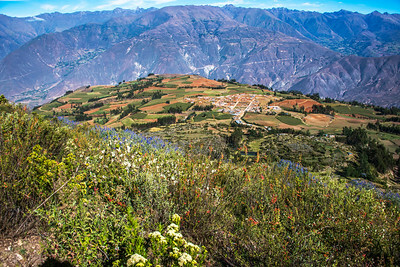 In the Andes, Ayllu (community) and Ayni (reciprocity) are fundamental to existence. There is no me, me me...the power resides in we. Duality and a harmonious balance between masculine and feminine energy is necessary for survival and prosperity. You look after the person next to you first. You acknowledge that we need nature more than it needs us. It's simple really. When we go to the grave, it's our experiences and connections with ourselves, each other and the earth that will be our indelible footprint and legacy that carries on. Photography has been a wonderful tool for me to contemplate these things. My camera is my heart. It beats with my soul and is set afire in these quiet moments in the mountains to have this sort of introspection. 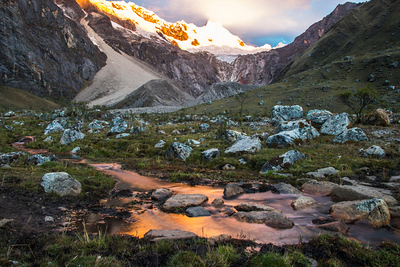 Sunset over Santa Cruz and Laguna Cullicocha in the Cordillera Blanca. Cheers to you Andes for always opening up your beautiful soul to me and making me feel right at home and infinitely teaching me about life. 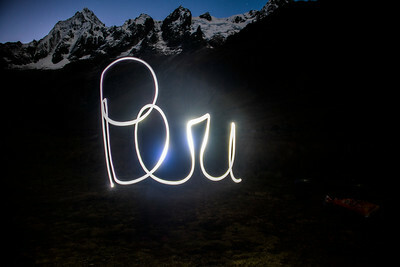 Having some fun with long exposures painting with light in the Cordillera Blanca. Sandy did a great job spelling Peru only using a headlamp and the blank air canvas.